Source, contact and hire the right person. 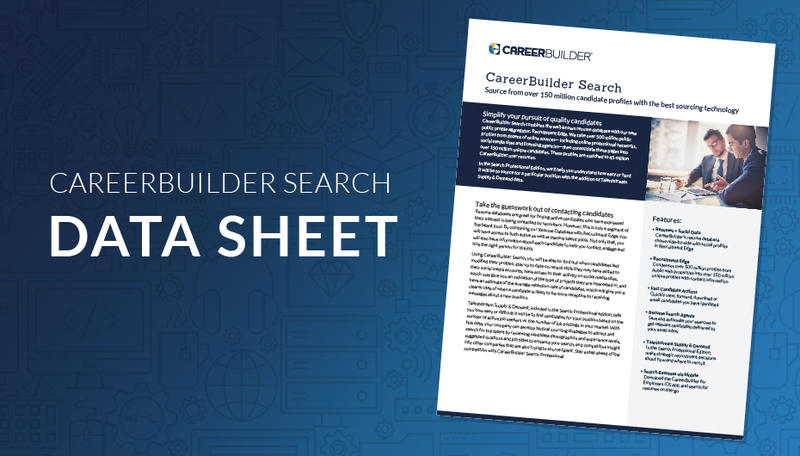 Search over 125 million candidate profiles in CareerBuilder's Resume Database search for employers. Get 50 resume views per day for one user with our Small Business resume access. Get the same 50 resume views per day for 1 user, plus 3 Jobs/month at no extra charge. Your card will be charged monthly, and you're free to cancel any time. Why Search Resumes in the Resume Database? Search resumes wherever you are using our iOS app. Actions sync directly with your CareerBuilder account. Search over 125 million candidate profiles including 45 million resumes. Save valuable time using our direct, verified contact information to call or email over 125 million candidates. Related terms applied to your searched terms expose you to all potential, relevant talent without the need for complex Boolean strings. Use over 15 filters including salary, years of experience and industry, and target talent by zip code to narrow your search to the right talent. With Resume Database Pro, discover competitive insights and candidate demographics (including diversity data) to understand how easy or hard it is to attract talent, as well as suggestions to improve or expand your search queries. An action is defined as a resume view. Any action taken on a resume after it is viewed - shortlisted, downloaded, forwarded, etc. - is included in the first action (view). An action is defined as a view of profile with strictly social information (no resume). In addition to the 300/day resume actions, you receive additional daily actions on Recruitment Edge profiles with social data only. Our Search software operates on a 1:1 license model. 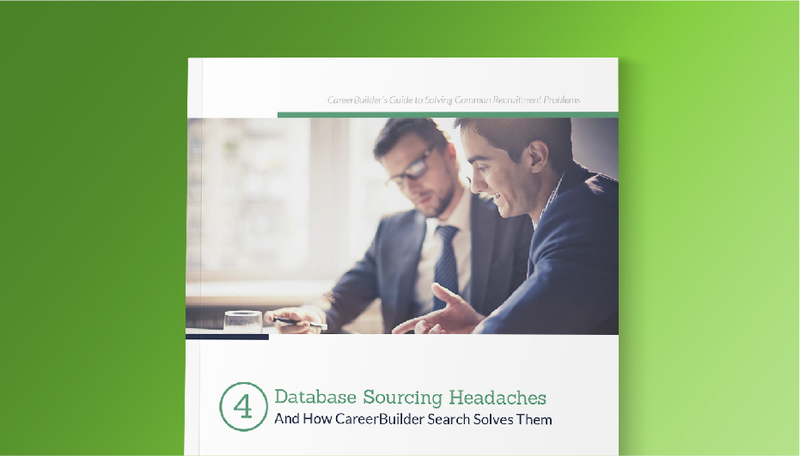 Every user will need his or her own license to access CareerBuilder Search. Resumes and social profiles from over 130 different sources are combined to give you a holistic picture of talent. Related terms are applied to each search term to provide more results, faster, while reducing the need to be a Boolean or industry expert. Related terms are transparent and can be customized. The newest tool that my team is really enjoying is Recruitment Edge because it is that one stop shop, if you will. We can try and connect with individuals via their email, via their phone links, social profiles - you name it, without having to go to all of those individual sites. By having those live email links on Recruitment Edge is actually proven to be very valuable and the response rate is, I would say, higher than average. Recruitment Edge is fantastic. I like that Recruitment Edge can aggregate all available social profile data and a candidate’s resume together into a single document including the candidate’s direct contact info. This could be my first go to tool to sync with our CRM/ATS efforts on candidates. This product is our go to source for field positions. The Resume Database gives us the depth of candidates that we are looking for to kind of support all our different positions against all of our different business units. We recently started using Recruitment Edge, and the more important feature is definitely providing contact information for candidates. That is one of the best things and is a differentiator over competitors. CareerBuilder is my #1 daily go-to for any question that I'm asked of. I typically go to Recruitment Edge if I'm sourcing candidates. If we need market intelligence, I go to the Supply & Demand data portals. I'm using them all the time, putting the two together. For example, if a recruiter has a difficult role to fill I might start in Supply and Demand and see what's out there and then target specific companies to fill candidates from that portal. We’re available Monday - Friday 7:30 a.m. - 6:00 p.m. CST. Can I be invoiced/billed monthly for my order? When purchasing through our online portal, you must pay for your order with a credit card at the time of purchase. If you would like to speak with a member of our Sales team about other payment options, please call 1.877.345.5256. Will I receive a receipt for my order? Once your order is approved, you will receive a receipt for your purchase by email. You can also view all of your orders and download invoices/receipts in the Online Transaction History tab on your Account Information page. Is this a recurring payment? Each pay as you go purchase is a one-time payment. You can purchase one month to one year access to search resumes. Once your access has expired you will no longer be able to use search resumes. Monthly subscriptions last one month and renew automatically every month after sign up date. For example, if you signed up on September 10th, your next billing cycle will start on October 10th. Annual subscriptions renew automatically every calendar year after sign up date. For example, if you signed up on September 10th, 2017, your next billing cycle will start on September 10th, 2018. Renewals will be charged to your credit card on file. Are there any discounts or promotions available? We frequently offer promotions and online discounts. View current deals on our Online Promotions page. These promotions are for online purchases only, and multiple offers cannot be combined at point-of-purchase. When will I have access to search resumes? There may be a delay between when you complete your purchase and when you have access to Resume Database. For the safety of employers and job seekers alike, our security team does a thorough review of employers before we allow access to jobseekers’ information. Is there a free demo or trial before I buy? We do not offer a free trial but if you would like to see a demo of any of the Resume Database editions, you can complete the “Request Demo” form and a team member will follow up with you shortly. If I don’t use my actions, do they roll over to the next day? Resume Database is a subscription model and users are given access based upon the duration of time purchased. You can use Resume Database at any time during this time period, but once you reach your daily view limit, your access will be shut down until the next day. Unused actions do not roll over. who are willing to relocate? You will have access to candidates nationwide. You have the option to set your location and search radius when conducting your search. Additionally, in your search results you can see candidates who are looking to relocate to the area you are searching. Can I search for candidates outside of the United States? Resume Database is for candidates located in the United States. If you are looking to fill positions outside the United States, including Canada, we do have country specific products. For more information, please reach out to our Sales team at 1.877.345.5256. ©2019 CareerBuilder, LLC. All rights reserved.